So we are talking chocolate here. And hazelnuts. The real thing. Homemade (which means potentially you can never run out of it). Easy. Quick. And chocolaty. Did I mention it is also totally vegan? And has no added oils? So if you love Nutella, but you are too environmental conscious, or simply you like tasty homemade spreads, this is the post for you. I tried this recipe over and over again, so many times that right now it doesn’t really matter which chocolate or rice milk you use, it’s guarantee it’s going to work. It has the only downside that it will last maximum 2 weeks in the fridge (no preservatives here!) but seriously, who am I kidding? If it lasts more than one week, you either made too much (impossible) or you have an admirable self control! Let’s not wait further and dig in! The process is pretty simple. 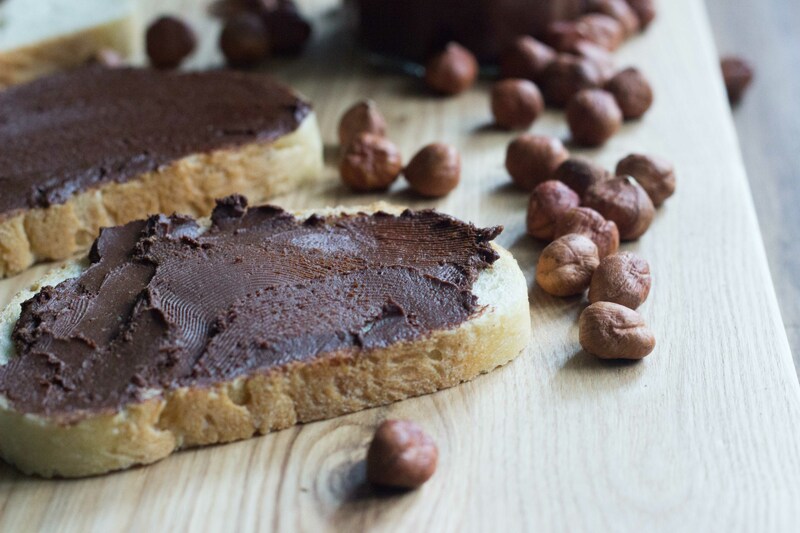 Toast the hazelnuts in the oven for 5 minutes at 180°. Transfer them into a clean cloth and rub well until most of the peel come off. Pour them into a blender with the sharp tool. Now this passage is easy, but you need to be patient. Blend the nuts at full power until they form a butter. Easy right? It will take from 15 to 20 minutes, and you will need to periodically stop and scrub down the crushed nuts from the sides of the blender. Don’t lose hope, it will eventually get very smooth! While you blend the nuts, melt the chocolate. I don’t have a microwave, so for me the best is the bainmarie, so bowl on top of a pot of hot water, then set aside when it melted and became glossy. Gently heat the rice milk, very very low heat, and add the cocoa, salt, syrup and vanilla. Pour both the chocolate and the milk and cocoa mixture in the blender and mix gently but well. 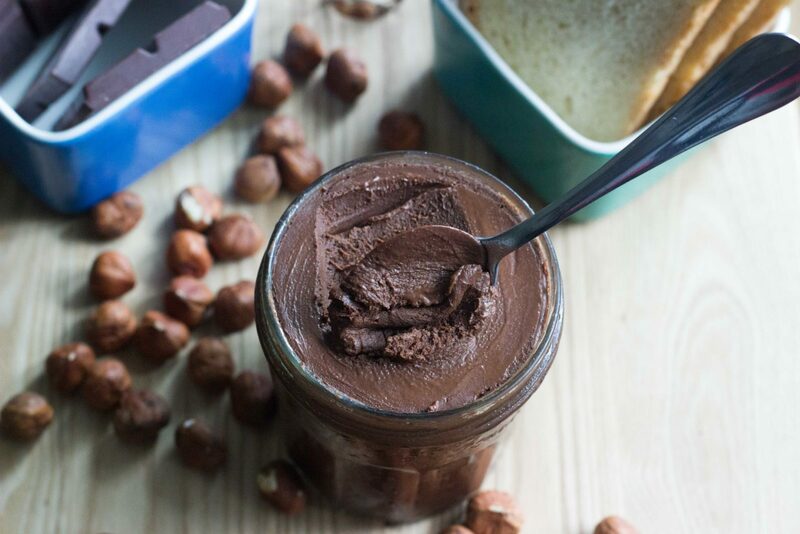 Pour the chocolate and hazelnut in single jars (should fill 2/3 jars) and leave in the fridge to firm up. Again, don’t worry if it looks a bit fluid, it will thicken and become the nice, smooth and delicious spread you are looking for. And I leave you with Wish List, by the wonderful Peal Jam.